Ticket price includes; entry to the Reindeer Lodge, meet the reindeer, reindeer talks, donkey rides and fairground rides (*3 ride tokens per child included), Timed ticket entry into the Elf Stage Show and Santa's Grotto where each Child and Baby ticket holder receives an age appropriate gift. Babies under 1 year are free to enter with a paying adult (1 baby per adult ticket). Adult ticket holders do not receive a grotto gift. Please select the date and time you would like to enter the Stage Show and Grotto and book the number of entry tickets required. 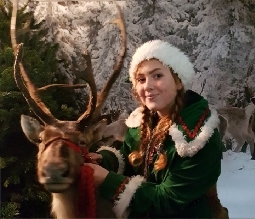 Please enter the Reindeer Lodge 1 hour before your Stage Show and Grotto ticket entry time to see the reindeer and enjoy the rides and attractions on site. Enjoy a festive family treat at one of North West and North Wales' best Santa's Grottos this Christmas at the Reindeer Lodge! Complete with enchanted woodland, lakes, fresh water streams and paddocks. 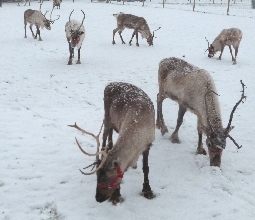 Meet our adorable reindeer herd, watch the fun Elf Stage Show, meet Father Christmas in our amazing new Santa's Grotto for 2019 and enjoy fairground and donkey rides along with lots of great family photo opportunities with reindeer, sleighs, elves and the big man himself. Entry Tickets are pre-booked online with limited availability for each entry time. 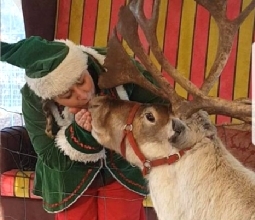 Please book the ticket time that you would like to go into the Elf Stage Show and Santa's Grotto, please arrive 1-hour beforehand for entry to the Reindeer Lodge to meet the reindeer and enjoy the rides and attractions. In addition to the attractions included within the entry ticket price there's also some fantastic memorable photo opportunities to be had for your family albums, either with your own camera or by purchasing some of our professional prints available on the day. With pictures to be had with our Reindeer and traditional Sleighs, Elves and souvenir photos with Father Christmas himself. There's also hot festive food and drinks, facepainting and a Candy and Gift Shop to enjoy during your visit. We look forward to seeing you soon!